Private W. Harrison Tice. 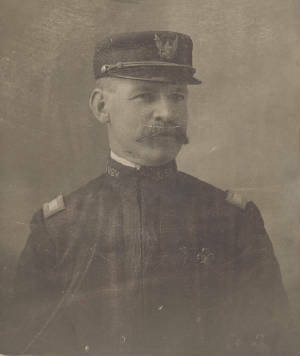 Co. C.
William Harrison Tice was born in upstate NY (near Ellenville) on 23 March 1843, he went by the name Harrison. He was the son of William Tice of Ellenville and one of thirteen children. The Tice family came from Ellenville, Phillipsport and Montgomery areas of Sullivan County NY. They are descendants of a Palantine German immigrant, Jost Heinrich Theis, who came to America in 1735. 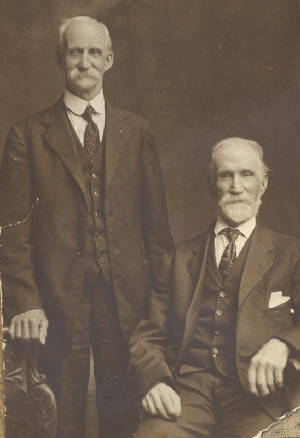 Harrison's two brothers also served in the Civil War, Alexander (20th NY Militia / 80th NYSV Co. D) and Elijah (156th NYSV Co. D). Alexander Tice was killed at Gettysburg on 1 July 1863 at McPherson Ridge and is buried in the New York section of the Gettysburg National Cemetery. His other brother, Elijah Tice served under Sherman and Sheridan. His mustering out paper states he was drafted on 24 June 1864 for three years and assigned to Co. C., 62d NY Veteran Volunteers and mustered out in Fort Schulyer, New York Harbor on 30 August 1865. Harrison married Anne Bowes (a Quaker) and had apple orchards after the war. He and Anne had two children, Ella (born August 1864) and Arthur (who has killed in a train accident in 1906). "Harrison Tice, age 87, died Monday night at the home of his daughter Mrs. DeWitt W. Ostrander, at Clintondale. He was a veteran of the Civil War and a member of the G.A.R. Post at Ellenville. Funeral on Friday at 2 PM at the home of his daughter. American legion in charge of the service..."
Biographical information, photograph and mustering out paper courtesy of W. Harrison Tice's great great grandson, Matt Tice (Maine, USA).